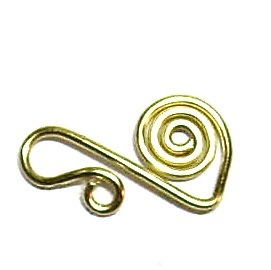 A spiral clasp can be used on different styles of beaded jewelry and chain maille bracelets. The following style is commonly found on the above types of bracelets. Lightweight versions are sometimes used on necklaces. Quite often made from half hard sterling silver the wire tension enables the clasp to hold its shape very well. It will lock the jewelry piece in place securely. Practice with 22 gauge wire; use 18 or 16 gauge on beaded jewelry bracelets. Some chain maille bracelets may need 14 gauge or possibly 12 gauge wire depending on the design features. It is advisable to use artistic craft wire to practice with, as it is inexpensive. Step 1: Make a spiral As per the instructions for Making Wire Spirals. Using your round nose pliers make a small loop on the other end. As per the photo the loop is under the wire facing the spiral. Step 2: The wire must now be bent to create a large loop on the wire, this is the loop that is used to fasten the jewelry item. Grasp the wire with your round nose pliers against the small loop. Step 3: Using your thumb push the wire around the pliers to form a loop. Once you have done this the spirals will now be on top of the wire. Step 4: With your flat nose or chain nose pliers grasp the wire with the pliers against the wire spirals. With your thumb press the wire upward so that it rests against the spirals. To fit the clasp to a bracelet open the long leg slightly and slide the clasp through the loop or jump ring on the end of the bracelet, squeeze the leg closed. The small loop opens and closes to fasten the bracelet around your wrist.